Communities of Practice in Health and Social Care highlights how communities of practice (CoPs) can make service development and quality improvement in health and social care easier to initiate and more sustainable. Using a series of case studies from the UK and Canada the book demonstrates how the theory of CoPs is implemented in the delivery of health and social care and highlights the associated potential, complexities, advantages and disadvantages. Communities of Practice in Health and Social Care equips practitioners, managers, educators and practice mentors with the knowledge and skills to facilitate the development and maintenance of Communities of Practice and highlights how the effects of Communities of Practice might be made explicit. Andrée le May is Professor in the School of Nursing and Midwifery at Southampton University. She has written, researched and taught widely on Communities of Practice, Evidence-Based Practice and Knowledge Transfer. In addition she is an experienced author and teacher. Part 1 Introducing Communities of Practice. Chapter 1 Introducing Communities of Practice. Chapter 2 The EXTRA Community of Practice: Incubating change. Nina Stipich, Jane Coutts and Mireille Brosseau. Chapter 3 The Interior Health Nurse Practitioner Community of Practice – Facilitating NP Integration in a Regional Health Authority. Chapter 4 Developing Dermatology Outpatient Services through a Community of Practice. Judith Lathlean and Michelle Myall. Part 3 Generating professional and patient capital. Chapter 5 Practice made perfect: discovering the roles of a community of general practice. John Gabbay and Andrée le May. Chapter 6 Learning nursing in the workplace community. Chapter 7 Communities of practice and learning health practice in developing countries. Chapter 8 Generating patient capital: the contribution of story telling in Communities of Practice designed to develop older people’s services. Chapter 9 What works, what counts and what matters? Communities of Practice as a locus for contributing to resource allocation decisions. Helen Roberts, Alan Shiell and Madeleine Stevens. Chapter 10 Where does this get us and where will we go from here?. 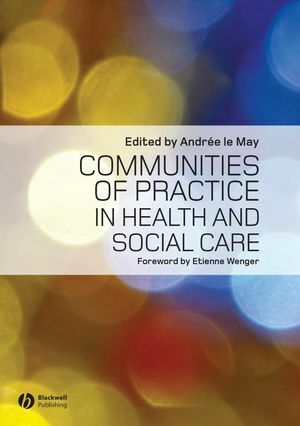 First book to look at communities of practice in health and social care.